I’ve already proclaimed in other places here on this site that Snape is the only Harry Potter character I really care about. My Snape love knows no bounds, so you can bit that I’m popping a new color ink cartridge into my printer and churning out a copy of this, Snape’s first Harry Potter and the Deathly Hallows Part 2 character poster. Like all the other character posters we’ve shown you so far this one ominously proclaims that “it all ends”. It does. After more than a decade watching these movies the last one arrives on July 15th. 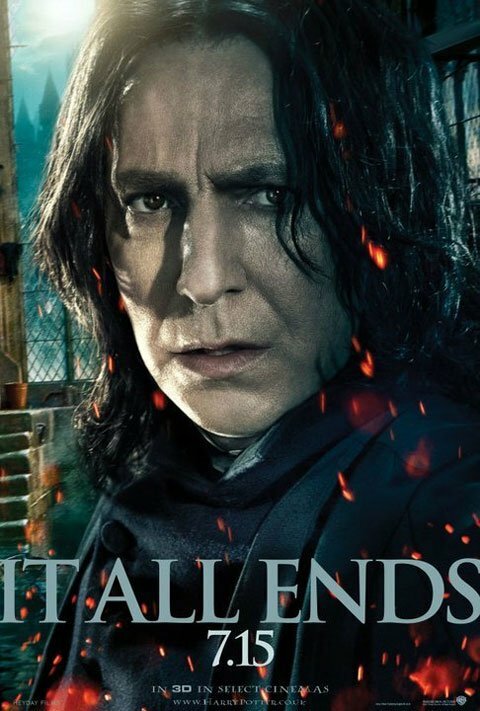 Here’s Alan Rickman’s final Harry Potter poster. There’s every reason to think Rickman is as bummed out to be saying goodbye to this character as we are. If you missed it make sure you go check out the heartfelt goodbye to Harry Potter Alan wrote and published last week.